How to color code a SharePoint list date field based on comparison with todays date? 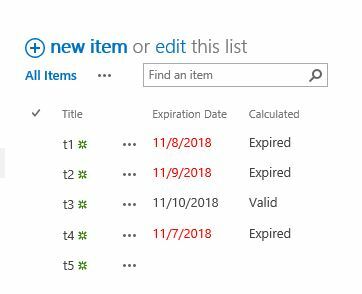 I have a SharePoint list with a date column called 'Expiration Date' containing a date value. Using some JS code, I would like to first check if the date value equals to today and if so I would like to highlight it in red. Can someone help me with the JS code for the same. Node: I am working with SPOnline. Yes, you can use json formatting to conditionally color fields in sharepoint online. The following example colors the current date field red when the value inside an item's ExpirationDate is before the current date/time. "color": "=if([$ExpirationDate] <= @now, '#ff0000', ''"
Source: Use column formatting to customize SharePoint. You can use Client Side Rendering (CSR) which represents a rendering engine for list views, list forms and search results. I would recommend you to consider the following approach for your task. For more clarification and how to add this code in JSLink of list view, see my answer How to Highlight a Row on Active Status. SharePoint 2013 Client Side Rendering: List Views. In Classic UI, we can add the following code into a script editor web part in list view to achieve it. Not the answer you're looking for? Browse other questions tagged sharepoint-online json-formatting date-field color-field or ask your own question. Color code the SharePoint list column value based on a condition? How to color code the SharePoint list column value based on a condition? How to design calculated column formula for multiplication based on nested IFs? How to calculate value for calculated field in SharePoint using formula? How to correct below calculated date field's formula for SharePoint list calculated field?